The following article explains how to convert an AbiWord native file format (abw) to a PDF document. The conversion is made with the novaPDF converter, which allows creating a PDF from any Windows program that has printing support. Use the Download page to download and install the novaPDF application on your computer to be able to make the conversion. Abw is the native file extension for the AbiWord cross platform word processor. One of the main advantages of the file format is the increased portability as it can be opened and managed on all the major Unix/Linux systems, Mac OS and Windows. The AbiWord application is designed mostly for end users and for simple documents written on a day to day basis, it is very easy to install and manage and takes very small computer resources. However the abw files are dependable on the AbiWord application to also be installed on the computer and cannot be opened by any other readers or editors so having the abw file converted to a PDF provides advantages such as faster file management and sharing, the possibility to add security features and signatures to the file etc. 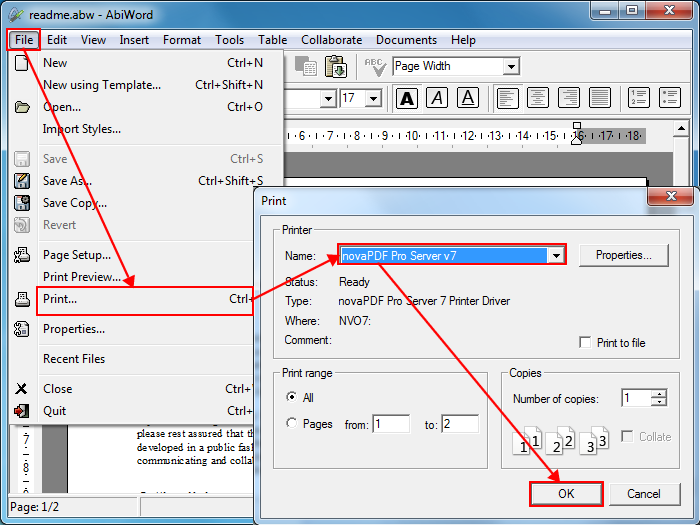 Open the abw file in AbiWord by clicking on File -> Open or Ctrl + O to browse for it on the local computer or over the network. After opening the file go to File -> Print or press Ctrl + P and when the printer list opens choose novaPDF as the printer name. Click on OK and in the Save PDF File dialog choose additional options like PDF merging, e-mail sending, choosing a custom path to save the PDF in and more. After the conversion is completed the PDF will open in the default PDF reader if selected. Once you have the file in PDF format, you can setup bookmarks, watermarks, document information, add signatures on it and more. There isn't much resemblance between these 2 formats as they are mostly useful in different situations however using the PDF format for your everyday work or other personal interests has many advantages over having the file in abw format as you have more options at your disposal for multimedia and presentations, you have a ISO standardization for file sharing and archiving and you can customize the same file for multiple purposes (sensitive information protection, high quality graphics, interactivity with other type of media).